Approach Guindacpan island in the Philippines by boat, and it looks like yet another tropical paradise. Deep blue waters sparkle like gemstones while thatched roof huts and coconut palms stand out against the bright blue sky. Closer to shore, however, the idyllic scene is decidedly tarnished. Instead of sand, the beach consists of stratified layers of modern human consumption: plastic bottles washed up from distant landfills, suitcases that have fallen off boats, the idle litter of residents, and miles of torn, crumpled, discarded nylon fishing nets. According to the UN Environment Programme, fishing gear has been lost, abandoned or otherwise discarded in the earth’s seas and oceans ever since humans began fishing. The problem has worsened significantly in the last 50 years, and it is estimated that nylon fishing nets make up around a tenth of the plastic trash in the seas. Harmful impacts include beach debris, coral reef destruction, synthetic materials in the food chain and so-called “ghost fishing,” where nets continue to catch fish, turtles, sea birds and more. The situation is a disaster in places such as the double barrier reef off the coast of the Philippines, where the Zoological Society of London says that every year there are enough discarded nets to wrap around the world nearly one and a half times. Like most of the people on Guindacpan, Torreon comes from a family of subsistence fisherfolk. Her husband and brother are out on their wooden outrigger boat, trying to coax enough squid into their nets for dinner. Torreon is on the beach with about two dozen other women, chattering as they rake up trash and tug at muddy old nets, collecting them into a pile. On their days off, the fishermen dive off their boat and bring up any discarded nets they find on the seafloor. The collected nets are cleaned, then sold by the kilo to a business called Net-Works, launched in the Philippines in 2012 by the Zoological Society of London, a conservation group, and Interface, a multinational manufacturer of carpet tiles. Net-Works ships the nets to Slovenia, where another company recycles and spins them into nylon thread. Then Interface weaves the threads into modular carpet tiles, selling them to corporate customers such as IBM and Unilever. So far, Net-Works has collected nearly 88 tonnes of waste nets in the Philippines—a small share of the eight million tonnes of plastic trash estimated to enter the ocean each year. 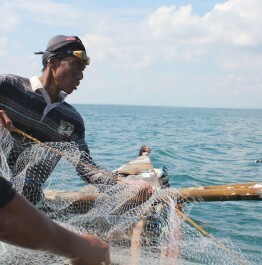 However, said Dr. Nicholas Hill, livelihoods specialist for ZSL, “We are targeting marginalized communities in critical biodiverse areas.” The success of the program is measured not in the quantity of nets they pull from the ocean, but in the improved livelihoods of the people they work with, and the important coastal habitats where they live. Net-Works calls itself an “inclusive” business: it is profitable, creates employment for low-income communities and has positive environmental impact. Torreon earns a few pesos for every kilo of old nets she brings to the Net-Works collection facility. It’s not a lot, but the money helps pay for daily necessities for some of the world’s poorest people. Guindacpan island is one of 20 collection hubs in the Philippines, and the Net-Works program benefits more than 55,000 people throughout the country. Net-Works also organizes savings clubs for each collection facility, pooling a portion of the money earned and lending it to members. These loans have paid for schooling, funerals and hospital bills, as well as investments in other types of livelihoods such as seaweed farming or small shops. In 2015, Net-Works replicated the project in the Lake Ossa region of Cameroon, and it plans to expand into another country in Southeast Asia. But Stansfield is thinking even bigger.